By now it's a well worn line, but one that remains pertinent: the Moto G changed everything. Just a few years ago, Motorola released what would become its best-selling device ever, and, in doing so, changed the budget smartphone landscape in the west irrevocably. The Moto G has set a standard by which consumers measure every other similarly priced device, and manufacturers have taken note. The 720p screen, once something of a rarity, is now commonplace, as is the respectable list of quad-core contenders from Qualcomm. Microsoft, with the Lumia 640, Acer, with the Liquid Jade Z, and many others, have now recognised Moto G as the benchmark they need to surpass. And LG is no different, entering the fray with the baby brother to its flagship, the LG G4. Sporting a 720p, 5-inch screen, a quad-core 64-bit Snapdragon 410 processor and an 8 megapixel rear-facing camera, it is a solid contender. 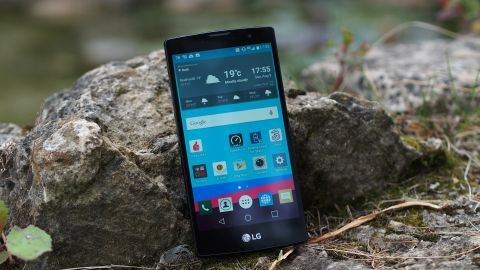 Since the Nexus 5 and the LG G2, LG has been working hard to improve its smartphone credentials, keen to achieve the same lofty heights as its arch-rival, Samsung. And following the release of the G3 last year to great commercial success, it has only continued to gain momentum. But with the competition heating up significantly and many other companies offering similar specs, LG's continued success is far from guaranteed. Having so far failed to establish a solid foothold in the budget market, the LG G4c is an important release for the South Korean conglomerate, so can it live up to such high expectations? A few years ago, predictions regarding the future of smartphone design were commonly skewed towards one particular form factor: the curved screen. Pioneered by the likes of Samsung, curved screens seemed to offer a perfect balance to the ever increasing screen sizes that now greet consumers with every passing release. Only LG ever made good on the promise, however, and committed to taking what was then a prototype to the next level. It started with the LG G Flex, a cumbersome monster, and then advanced with the sleek G Flex 2 early this year. These so-called 'gentle curves' have begun making way into many other LG devices, including the G4 and its smaller brother, the G4c. Upon picking up the device for the first time, I was smitten. When compared to the hard metal edges of my Nokia Lumia 930, the comfortable curves of the G4c have proven to be something of a revelation. In reality, the curve is only very slight. For all intents and purposes, the screen is completely straight, only falling a single degree or two across its entire length. The rear of the device bends into the palm, allowing you to hug its shape closely. What this makes for is excellent one-handed usability. Asides from the curve, pleasant though it may be, the device bears all the hallmarks of LG's typical design language. The only buttons present on the G4c, a power button and volume rocker, rest on the rear of the device, just underneath the camera. Again, this makes using the device a piece of cake, as these buttons are placed exactly where fingertips tend to lie. This is a device designed with user comfort in mind, something only emphasised by the thickness of the device. At 10.2 mm, the G4c is thicker than some of the competition, but not noticeably. Weighing in at 132g, it manages to be light without feeling insubstantial. Coupled with some impeccable balancing, all of this comes together to make the LG G4c feel very natural in the hand. This emphasis of function over fashion is refreshing and bodes well for future devices from the company. On the top of the device, as is customary, there sits a 3.5mm headphone jack. Flip it over and on the bottom you'll see a Micro-USB port for charging and wired data transfer from a connected PC. The left side of the G4c is completely free from any buttons or interruptions, and on the right side sits a small (and very necessary) cut-out for prying off the back cover. The back of the G4c presents LG's only attempt at a visual flourish, with the matte grey plastic divided up into a small, attractive diamond tile pattern that catches the light ever so slightly. You will also find the single rear-firing speaker, 8MP rear-facing camera, a single LED flash, and the unique power button/volume rocker layout LG is known for, along with a discreet logo. Lastly, on the front of the device, there is the call speaker, the 5MP front-facing camera, a slightly more pronounced 'LG' logo and the 5-inch display. With a light two-tone design, LG has gone for the equivalent of baggy jeans and a comfortable jumper rather than something more complicated and less likeable. Although it won't win any awards for bold design, the emphasis on usability is more than welcome. At five inches, the LG G4c doesn't have the biggest display and at 720p (294 PPI), it isn't the sharpest. Yet, as a major manufacturer of televisions, the firm knows a thing or two about screen technology, and the G4c does not disappoint. For everyday tasks, such as watching videos, reading and using social media, the display on the G4c is more than sufficient. I found that I only noticed pixellation on certain text elements, with my nose hovering an inch from the display. It certainly never proved to be an issue day to day. Being an IPS display, I expected excellent viewing angles, and thankfully I was not disappointed. Even when viewing content from extreme positions, there was no drop-off in brightness, nor did the colours look washed out. Colour saturation also proved to be something of a strong point. Typically, budget screens suffer from milky blacks, off-whites and other unpleasant visual reminders of their price point. Thankfully, the G4c is nicely colourful, without looking as though it belongs in Toon Town with Roger Rabbit. The display is also 'oleophobic', meaning it's very smooth in general use. However, with an automatic brightness sensor that is slightly over-enthusiastic, the LG G4c display has a tendency to get slightly dim. It deals reasonably well in strong direct sunlight, but the sensor has an unfortunate tendency to assume every room is dimly lit, so some adjustment may be necessary throughout the day in certain weather conditions. Overall, asides from the brightness sensor, the panel on the LG G4c is exemplary for its price point. In comparison to certain rivals, especially the likes of the Microsoft Lumia 640, this is a very strong contender. Thanks to Three UK for providing the review unit.